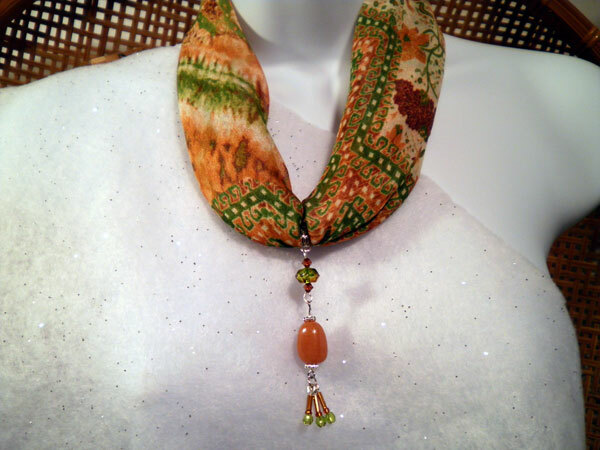 The scarf is a 21 x 21 square with variations of light and dark green, browns, white and oranges. The dangle is 3 inches long and starts with a beautiful green and brown faceted glass disc with small brown bicones above and below it. Next comes an orange stone surrounded by silver spacers. Hanging from that are 3 dangles created with brown bugle beads, brown seed beads and olive green faceted rounds. I've included over 30" of sheer brown ribbon that can be used to hold the pendant if you want to wear the scarf and jewelry piece separately. It can also be put onto any silver chain that you already own for an entirely different look.